The CropScan 3300H is a powerful Near Infrared Transmission spectrometer capable of measuring protein, oil and moisture in cereal grains and oil seeds as they are stripped in a combine harvester. The CropScan 3300H measure grains as they are sampled off the clean grain elevator. Grain drops into the Remote Sampling Head where it trapped for a few seconds while light is passed through the sample. A fiber optic cable collects the transmitted light and send it to the NIR spectrometer located inside the cabin. A Touch Screen tablet PC, which is mounted inside the cabin, controls the system and displays the protein, oil and moisture data in real time. Data is collected every 7-12 seconds which is displayed on the Touch Screen PC showing bin averages, field averages and real-time protein maps. The software sends the data to the internet where it can be monitored using a PC, Tablet or Smart phone. 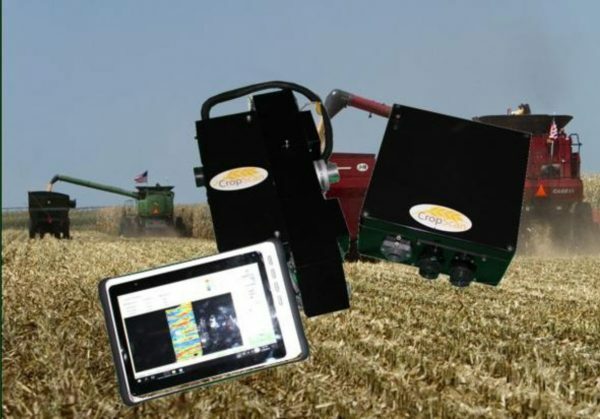 The CropScan 3300H On Combine Analyser has been installed on John Deere, Case, New Holland, Claas, Massey Ferguson and Gleaner combines around the world.